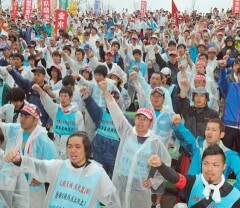 On May 19, at the 5-15 rally held at Ginowan Seaside Park, about 3,500 people called for opposition to the plan to construct a new base in Henoko and protested against amending the constitution. On May 19, at the Ginowan Seaside Park, the Okinawa Peace Movement Center and the 5-15 Peace March Executive Committee held a citizens’ rally to call for the protection of life and peace. This was held in the year that Okinawa marked the 41st anniversary of its reversion to Japanese sovereignty on May 15, 1972. According to the organizers, about 3,500 people from all over the country participated in the rally. They adopted a declaration opposing the additional deployment of MV-22 Osprey aircraft to Okinawa and the plan to build an alternative base for U.S. Marine Corps Futenma Air Station in Henoko in Nago. In the declaration, they protested against Osaka Mayor Hashimoto’s remarks that comfort women were “necessary” and that the U.S. military should use the local adult-entertainment business. They also opposed the Liberal Democratic Party administration’s moves to amend the Constitution and called for a nuclear-power free society. Kim Bok-dong, 87, who was forced by the Imperial Japanese Army to serve as a comfort woman said,” During wartime, everyone always end up becoming a victim one way or another. Let’s join forces to create a world without war.” She has called for the Japanese government to apologize and provide compensation.